Paul Appleby has not exactly taken the traditional route to being a professional singer. Unlike many of his colleagues, Appleby (M.M. 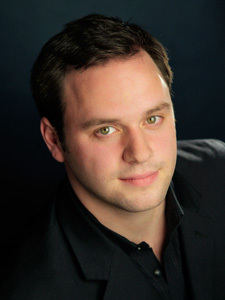 ’08, A.D. ’10), a tenor, attended a university for his undergraduate studies. Only after earning a bachelor’s degree in English literature from Notre Dame—in his hometown of South Bend, Ind.—did he audition for Juilliard. Ever since, his career has been steadily on the rise in the U.S. and abroad. Paul Appleby will perform Schubert’s song cycle Die schöne Müllerin on November 30. A National Winner of the 2009 Met Opera National Council Auditions and a current member of the Metropolitan Opera’s Lindemann Young Artist Development Program, Appleby, 27, has a busy season of recitals and operas planned, and on November 30 he will be the featured performer for Juilliard’s 14th annual Alice Tully Vocal Arts Debut Recital. As this year’s recital winner, Appleby is given an important public debut, a kind of “coming out” as he described it in a recent interview. Other projects this season for Appleby include recitals with the New York Festival of Song with Juilliard faculty member and pianist Steven Blier; the leading role of Jenik in Juilliard’s upcoming production in February of Smetana’s Bartered Bride with Maestro James Levine; and his Metropolitan Opera main stage debut in Ariadne auf Naxos as Brighella under Maestro Fabio Luisi.